It is almost a year since Stephen Auker was persuaded by his principal sponsors, a stairlift specialist, to take part in his first Stoke on Trent Potteries half marathon. He he completed it with usual style and effort resulting in an amazing finishing time of 1 hour 51 minutes. This large poster seen here was placed outside the Staffordshire stairlift specialist's head office at Wolstanton, Staffordshire for a few weeks before the race - and scores of people came in to leave a donation which boosted Castle Comfort's pledge of £1,000. The cash came with a condition - and until the start of the race Mr Auker assumed that the requirement to run the race with a Castle Comfort Stairlift model strapped to his back was wind up. But no... here is Keith checking the stairlift weighs in! Steve and ever supportive wife Julie were guests that weekend at the Borough Arms Hotel at Newcastle under Lyme. situated close to the centre of Stoke on Trent. The sponsoring company were pleased to arrange that all present were kept with plenty of liquid refreshment Vimto after the race! 'Stairlift Stephen' as he is affectionately known in Staffordshire had so far (as of June 2009) raised single handed £22,000 in aid of Cancer Research UK. See details of people's generosity here. (see below too for updated figures) Why does he do it? Stephen's own words - "Because cancer will touch ALL OF US in some way at some time. Plus one in three of us will actually PERSONALLY SUFFER from a cancer in our lifetime. This is my small way to help all of us and our children in the future." There is a lot more to this guy, and anyone with a heart and will to enjoy life, will enjoy learning about him -See Steve's Google profile here . And anyone reading this with a spare pound (or a million of them) just get your credit card out and go here or if you really have some bottle, speak to your doctor, and then click on the final 'here' below. See you in June! Do you want to enter the 'arf Marathon in Stoke on Trent one year ? do it here Failing that (and you can claim your doctor wouldn't allow you to have a coronary attack) - we'll catch you in Weatherspoons, Hanley on the big day! Mr Auker pictured in days gone by. 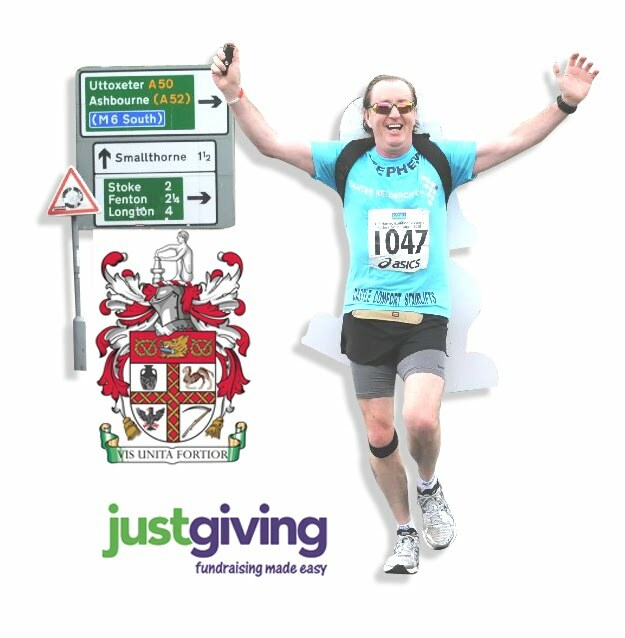 As he is now tee-total the finishing time in the Stoke on Trent 'arf marathon in future will be even more amazing! UPDATE 2010 JUNE THE BAD NEWS - STAIRLIFT STEPHEN TOOK ALMOST 20 MINUTES LONGER (2 HOURS 12 MINUTES) TO COMPLETE THE STOKE 'ARF THIS YEAR... THE GOOD NEWS ... He trained a new Castle Comfort Stairlifts runner- Bec from Stafford, AND DID THE WHOLE 13 MILES, THIS TIME - WITH THE STAIRLIFT ON HIS BACK - and earned another £1500 in total for the effort, which takes the total rasied so far to over £28,000 - well over half way to the target of £50k. SEE THE STAIRLIFT OSCAR-WINNING (GUINNESS-WINNING ACTUALLY) FILM HERE AND WOLSTANTON'S OWN WEBSITE IS ALSO PROUD OF THIS! You couldn't have picked a better picture of me. I was really looking forward to that Guinness (or 2) after the run. well done Stephen and Castle Comfort for supprting such a great cause. Well done Stephen and Castle Comfort Centre, this is totally amazing! Will put a link on our pages to your sponsor page. 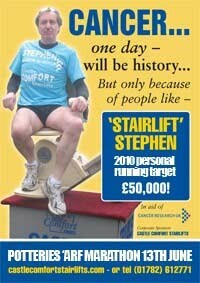 Stephen, now you have conquered Stoke on Trent, and Castle Comfort Stairlifts have opened an office in Dublin, Ireland - are you doing the Dublin marathon with TWO stairlifts on your back? You'll get double the Guinness!